Today I saw the first blooming Coneflower of the season. Well, first to me. 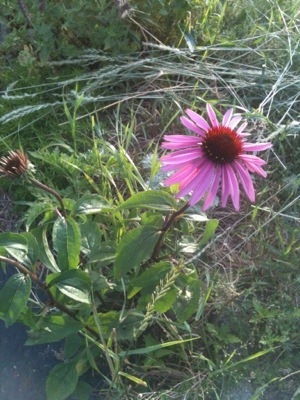 Most likely people in gardens south from Saratoga and Lake George have already seen Echinacea open. This one seems early; the ecological explanation for that is most likely because of it’s proximity to the hot blacktop. It bakes in the extra heated sun all day long and this forced it’s opening. No doubt the butterflies are ecstatic to see one of their favorite nectar producing plants attracting them early.